The Economist interviewed Eric Heginbotham and I on the strategic relationships linking China, India and the United States. The piece is called “America and the Asian giants: Spot the difference,” and it appears on The Economist China blog, Analects. Another piece in The Economist print edition looks at the recent U.S.-India Strategic Dialogue and the logic of closer U.S.-India strategic relations. China’s spectacular economic rise over the past decade has generated a great deal of strategic anxiety in foreign capitals and particularly in Washington DC. A thriving cottage industry has sprung up around trumpeting the ominous import of China’s military build-up and Beijing’s supposed intent to remake or upset the world order. Many such forecasts—often driven by bureaucratic imperatives to justify ever-larger defense budgets—rely on selective or misleading use of data, extravagant extrapolations from a handful of ancient Chinese texts, and pure ungrounded speculation. Into this darkened room stale with hot air and heavy breathing George Gilboy and Eric Heginbotham’s excellent book introduces a fresh breeze of clear thinking and the illumination of careful factual research. Gilboy (a longtime Beijing resident who now represents Australia’s Woodside Petroleum) and Heginbotham (an analyst at a US strategic think tank, the RAND Corporation) do not aim to minimize the strategic challenge that a rising China poses to the US. But they do seek to represent it accurately, and more important to put it in a wider context. Their work is essential reading for anyone who wants a serious understanding of China’s international strategy, military doctrine and capacity, and potential impact on the global power balance. Their main technique is to abandon the usual tack of considering China in isolation. Instead, they build their work around a meticulous comparison of the two great Asian powers, China and India. This approach challenges the facile identification of democratic India as an international good guy and authoritarian China as a bad guy. The authors show that in their international engagements the two powers are in many ways indistinguishable: both are ancient civilizations whose classic texts on statecraft emphasize hard realism and the use of guile and deception; since 1980 the two countries have shown an equal propensity to use force internationally; both countries have aggressively sought access to supplies of energy and other natural resources abroad and have done deals with nasty regimes (such as Sudan, Myanmar and Iran) to achieve their aims. In fact, by certain measures India has been much more aggressive than China. While China has attracted much recent opprobrium for territorial claims in the South China Sea which it has little capacity to enforce, India has a decades-old declared policy of regional hegemony in south Asia under which it has conducted a series of forceful incursions: the initiation of a war in 1971 that split Pakistan and created Bangladesh; the annexation of the independent Himalayan state of Sikkim a few years later; intervention in Sri Lanka’s civil war in the late 1980s; and an economic blockade of Nepal in the 1990s. Military writers have made much of China’s supposed ambitions to build a blue-water navy, citing its recent purchase and re-commissioning of a rusty old Russian aircraft carrier. Yet India, with designs on control of the Indian Ocean, has had at least one aircraft carrier in active service since 1961, and now has two—double China’s fleet. Given that India and Pakistan are now both nuclear-armed powers, Indian military adventurism is arguably far more threatening to core American and global interests than China’s more tentative thrusts. The book’s forensic analysis of military spending is a tour de force, and a salutary corrective to the distorted and dishonest presentation of Chinese defense expenditure often fed to Western audiences by self-interested military bureaucracies and their harried stenographers in the press. Reports of Chinese military spending usually focus on high rates of absolute growth, and make vague and poorly-documented claims that true expenditure is “much higher,” due to items hidden in other budget lines. These reports almost invariably fail to examine defense spending as a share of GDP or the overall government budget, and ignore the fact that all countries—not least the US—routinely spend far more on the military than is revealed in official defense budgets. (The entire cost of the Afghan and Iraq wars, for in stance, was carried off budget.) Speculative figures about “true” Chinese military spending are often compared to narrower officially reported US defense budgets. Another common dodge is to mark up China’s military spending using (often inflated) purchasing power parity adjustments, while reporting other countries’ spending at market exchange rates. The authors masterfully demolish this edifice of deception, and clearly demonstrate that while China is undoubtedly engaged in an aggressive program to modernize its military, the weight of defense spending is consistently lower in China than in India (as a percentage of GDP or overall government budgets). And despite recent increases, China’s military expenditures are a small fraction of America’s, and there is no evidence the gap is closing. In 2010, the authors estimate China’s fully-loaded defense spending (including off-budget and hidden items) at US$113 bn, or 2% of GDP. This is less than one-seventh of what the US spent on its official defense budget plus veterans benefits: US$802 bn or 5.5% of GDP. Gilboy and Heginbotham’s aim is not to dismiss the strategic challenges posed to America by China and India, but to insist that these challenges be met by a “nuanced, pragmatic realism” rather than fantasies or prejudice. This realism recognizes, first, that in many core areas the interests of China, India and the US are aligned: all three countries “oppose religious extremism and terrorism, support the continued deepening of global economic integration, and are… committed to a peaceful, stable and prosperous environment in Asia.” It also recognizes that Chinese and Indian leaders are far busier with domestic social and economic problems than with global force projection, and that their military build-ups mainly target narrow regional concerns (in China’s case, Taiwan; in India’s, policing weak and unstable neighbors). The principal concern of American strategists, the authors argue, should not be responding to a fanciful scenario of China as a latter-day Wilhelmine Germany or Soviet Russia. Rather it should be the tricky task of managing the “nested security dilemmas” in Asia as China and India rise as regional powers while weaker neighbors hedge their bets—in the case of North Korea and Pakistan by building up dangerous nuclear arsenals. Prudent emphasis of core American values like democracy and human rights should be a core part of the strategy, but this should not mean demonizing China while whitewashing India’s often equally egregious violations both at home and abroad. For the most part, this prescription already guides the permanent elite of foreign policy decision makers in Washington. Gilboy and Heginbotham’s wonderful book creates hope that it will become a bigger part of the broad public discourse as well. Our view differs from the conventional wisdom reflected in policy circles and in some academic studies. Most see the United States on an inevitable path to conflict with China and natural partnership with India. Instead, Washington will face a mixed picture in its relations with both New Delhi and Beijing. There are under-examined opportunities for increasing cooperation with China and with India. At the same time, both of these rising powers are likely to present security challenges for the United States, although of different kinds. The interview appears on the Wall Street Journal China news page and also on the Journal’s excellent China blog, China Real Time, as well as the counterpart blog for India, India Real Time. Andy Browne also discusses our book in this video/interview with the Wall Street Journal’s Deborah Kan.
Space constraints meant that some of our answers did not make it into the interview. At one point we discussed our view that the United States needs to broaden and deepen its trade and investment relations with India. We also believe that Washington must pay much greater attention to developing greater alignment with New Delhi on major diplomatic and foreign policy issues, including global trade talks, climate change and energy, Middle East diplomacy, and nuclear arms dialogue. Greater common interests and greater diplomatic alignment will make for a more stable long term partnership and bring content to the logic of greater security cooperation. Security and geostrategic issues have taken center stage in U.S.-India relations. But both sides need to do more to build up a balanced relationship and a set of long term common interests that are not only defined by their mutual concerns about China. With co-author Eric Heginbotham, I’ve written a book about China and India as international strategic actors. 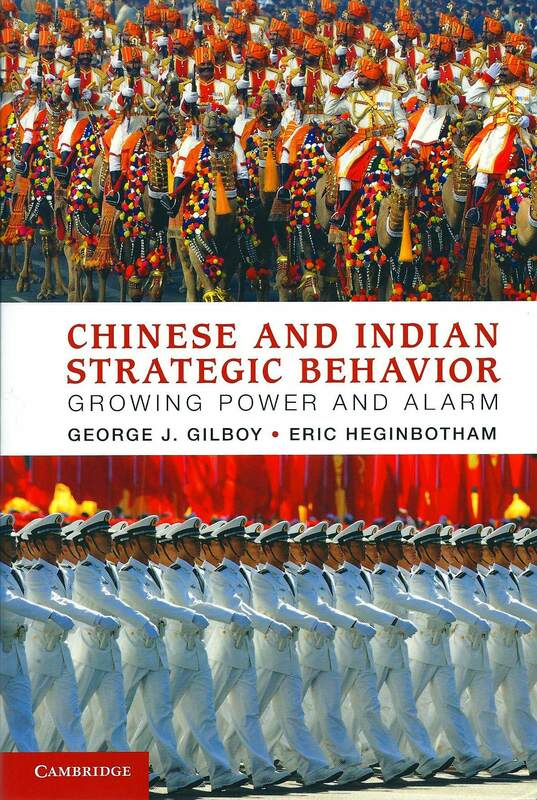 It’s called Chinese and Indian Strategic Behavior: Growing Power and Alarm (Cambridge University Press, 2012). This is the first book to systematically compare the track record of Chinese and Indian international action in foreign policy, military modernization, and international trade and investment. Rising Chinese and Indian power may spell “double trouble” for the United States. Rather than simply being a natural part of the solution to America’s problems with China, India is likely to pose security and economic challenges of its own. To learn more about the book please visit Amazon, Barnes and Noble, or Cambridge University Press.